afternoon visiting. The boys were putting up hay. After an early supper Will hitched to the Surrey and We took Mother home. It was bed time when we got back. 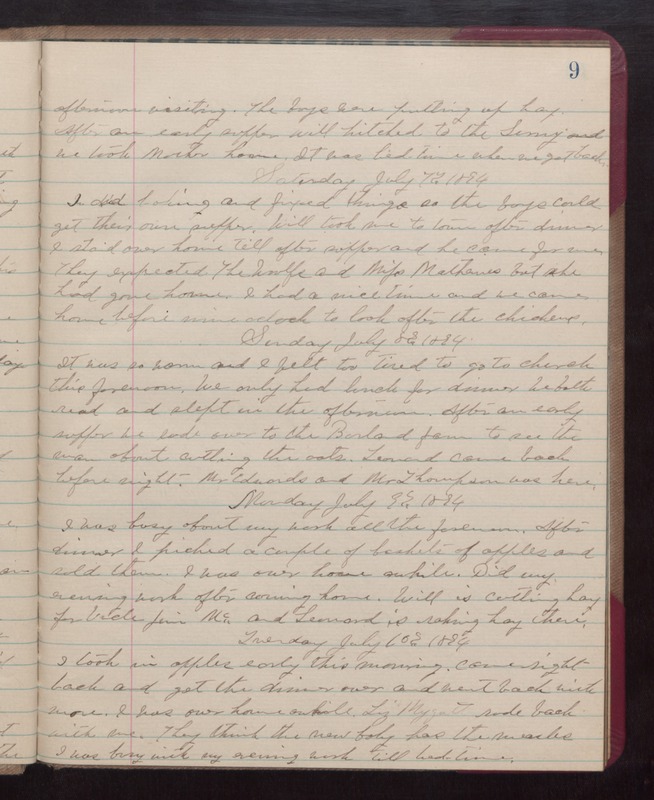 Saturday July 7th 1894 I did baking and fixed things as the boys could get their own supper. Will took me to town after dinner. I staid over home till after supper and he came for me. They expected The Woolfs and Miss Mathews but she had gone home. I had a nice time and we came home before nine oclock to look after the chickens. Sunday July 8th 1894. It was so warm and I felt too tired to go to church this forenoon. We only had lunch for dinner. We both read and slept in the afternoon. After an early supper we rode over to the Burland farm to see the man about cutting the oats. Leonard came back before night. Mr. Edwards and Mr. Thompson was here. Monday July 9th 1894 I was busy about my work all the forenoon. After dinner I picked a couple of bushels of apples and sold them. I was over home awhile. Did my evening work after coming home. Will is cutting hay for Uncle Jim Mc and Leonard is raking hay there. Tuesday July 10th 1894 I took in apples early this morning, come right back and got the dinner over and went back with more. I was over home awhile. Liz Mygatt rode back with me. They think the new baby has the measles. I was busy with my evening work till bed time.